Some people disagree with that statement. However, I know that if I don’t eat within the first few hours of waking up, I become a ‘bear’ of a person. For my boys who are growing and learning, being fueled in the morning is just as important. We need a good breakfast to function well through the day. While a dry cereal from the cupboard is quick, it is not always filling. Instead, I find that a piping hot bowl of oatmeal holds them longer. As a child, I remember being excited when the rare pomegranate would enter the house. Yes, it is a bunch of effort to eat the seeds. But, I felt like the special treat was so worth it! Now you can buy pomegranate seeds in a container if you don’t want to take the time. Beyond the distinct taste and ability to turn your fingertips red, there are many nutritional benefits for pomegranate. They have more antioxidants like punicalagin than other superfoods like acai berry juice or green tea. Pomegranates have high levels of vitamin C and vitamin K.
Important minerals like manganese, potassium, phosphorus, magnesium, calcium, zinc and iron are found in the tiny seed. The seeds have a decent amount of fiber and some protein. Oatmeal is a super easy breakfast to make. However, it is always nice to try a new mixture of add-ins to keep from getting bored. Or, maybe it is just me who would get tired of brown sugar or just apples with some nuts. 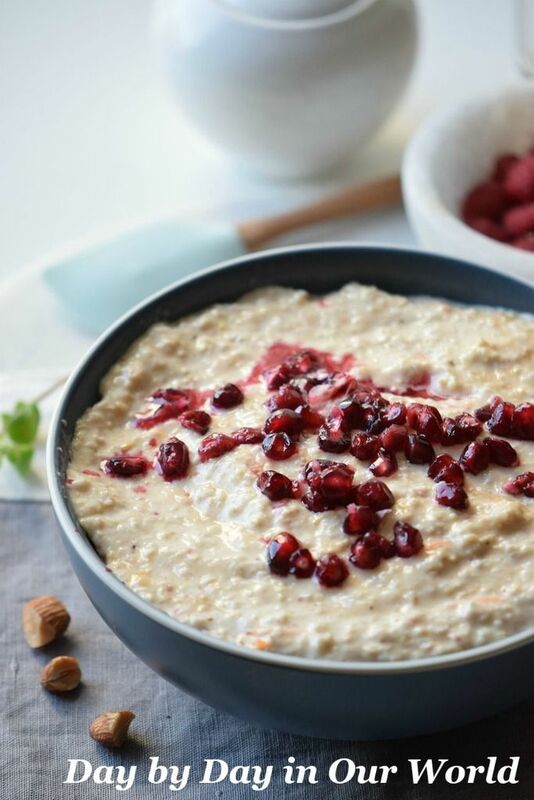 Pomegranates add a whole new flavor to the traditional bowl of oatmeal. They have a definite tart flavor and provide some texture as well. 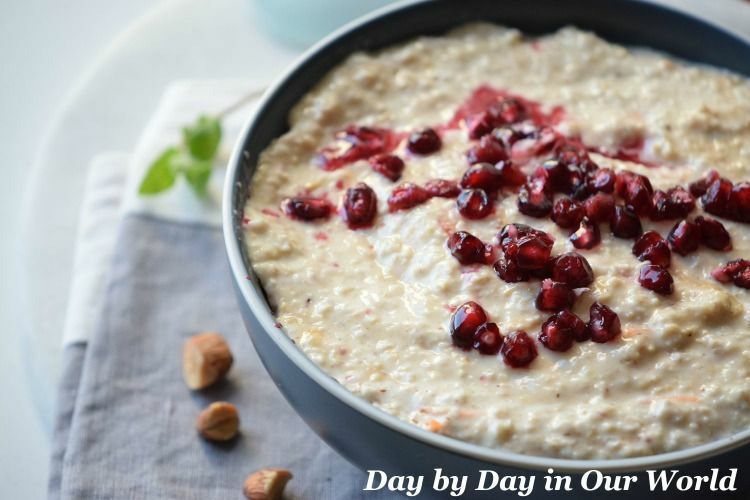 This oatmeal can be garnished with some chopped pecans and ground flax seeds. Both add more nutritional value to the dish as well as a ‘crunch’ factor. In a saucepan boil the milk, oats, and maple syrup. Stir until mix is evenly combined. Add the cinnamon and vanilla, and stir. Serve, top with pomegranate seeds, and enjoy. It could also be garnished with some chopped pecans and ground flax seeds. I know that the change in ‘toppings’ brings a smile to my face. And, along with the burst of tart sweetness in my mouth, I am reminded of memories of those special ‘treats’ in my childhood. 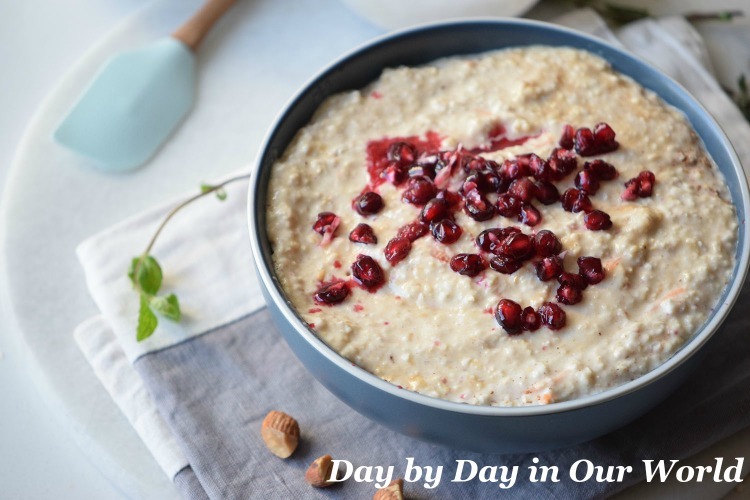 Does your family enjoy oatmeal for breakfast? What are some of their favorite toppings? Thanks, Elena. 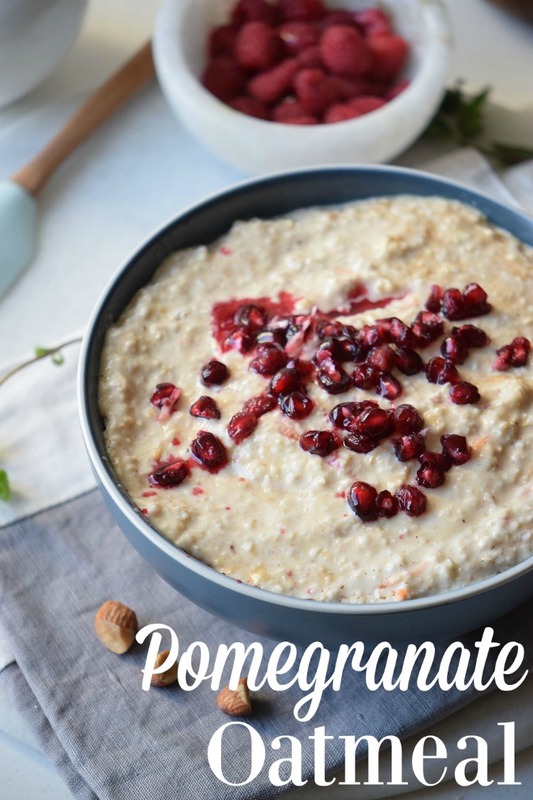 The pomegranate gives a nice pop of flavor to an otherwise 'bland' oatmeal. I remember, too, being kids and our dad opening a pomegranate - it was once a year and seems so special, good memories. This sounds delish and I'd love to try it, especially for fall!